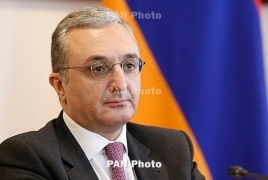 PanARMENIAN.Net - Armenian Foreign Minister Zohrab Mnatsakanyan has urged Azerbaijan to be "a more responsible and sensible negotiating party" in the negotiations over the settlement of the Nagorno Karabakh conflict. Mnatsakanyan's comments came after Azerbaijani President Ilham Aliyev said "Armenia has to understand that there is no military or strategic object that the Azerbaijani Army is unable to destroy." "Settlement of the Nagorno Karabakh conflict can be achieved exclusively through peaceful negotiations within the format of the OSCE Minsk Group co-chairmanship," Mnatsakanyan said in a tweet. "Warmongering and saber rattling are irrelevant, deplorable if not preposterous. "Inconsistency of language for internal consumption and at negotiations doesn’t work. "Need a more responsible and sensible negotiating party across the table."